” It’s official! Alpenglow Expedition’s 2016 Ama Dablam program is now under way. 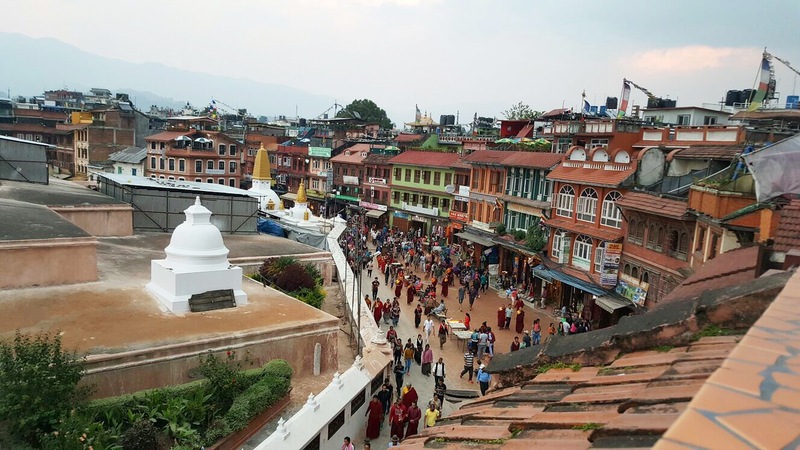 My jetlag is slowly subsiding and all team members including our Everest Base Camp Trekkers have safely arrived in Kathmandu. Today I finalized our last trip logistics by online chatting with our Sirdir Dorji who is currently in his home village of Phortse (gotta love technology right?!). We talked weather, conditions and confirmed that the proper gear and teammates are in position for a smooth transition for our arrival into Lukla and Ama base camp. The 2015 fall climbing season in the Himalaya was an interesting one. Upheaval in Nepal created a fuel shortage around the country and the normally bustling tourist centers were quiet. True to form, none of these hurdles stopped our team from venturing into the mountains. In the end the team put in a valiant effort to summit Ama Dablam but unfortunately were turned around before arriving at camp 3. Our 2014 Ama Dablam expedition has come to a close. The team collectively made the decision not to summit Ama Dablam this year. Below is a recap of the trip. Ama Dablam Team Summit Rotation Begins on Tuesday! The Ama Dablam team says hello from Nepal! They called via satellite phone and told us they tagged Camp 1 yesterday and spent a second night in Yak Camp last night. They got a good night sleep and began climbing to Camp 1 today with plans to tag Camp 2 tomorrow and then they will head back to Camp 1 tomorrow night. We’ve just received the latest update from our Ama Dablam climbing team. After arriving in Base Camp three days ago, they spent the first three days acclimatizing, having a puja blessing ceremony, and spent a day on nearby cliffs doing fixed rope training. Our strong Sherpa team, led by Dorji Sonam Sherpa, has placed tents at Camp 1 and a rescue tent at Camp 2, so progress is moving quickly on the mountain. The crew is Nepal doing well, everyone is healthy and moving fast. Our team is all together and the trek to Ama Dablam has begun! Last weekend, our mountain guides left the United States en route to Nepal to prepare for our upcoming Ama Dablam expedition, which begins this Friday. Yesterday and today, our Ama Dablam climbers will also leave the United States for Nepal, taking two days to get there and hauling a plethora of climbing gear. While the team will spend a great deal of their time on the mountain, they’ll also spend time in different cities and villages in Nepal.